We came across this news story out of England while researching warehouse safety issues. Here’s what happened: In May of 2016, a warehouse worker named Tomasz Wiszniewski at a company called Edwards Transport became buried under tons of packages of cheese after a massive warehouse shelving collapse. Apparently, the accident happened when Wisneiwski’s forklift bumped some shelving, creating a domino effect that triggered the collapse. He spent nine hours trapped under the wreckage, but amazingly emerged unhurt. Debbie Belcher, whose family owns the warehouse, said it was a miracle, but also a triumph for safety training. We’ve seen some people share this footage of a shelving collapse claiming that it’s the Edwards Transport incident, but we haven’t been able to confirm this. Still, it serves as a pretty dramatic illustration of what such an accident looks like. 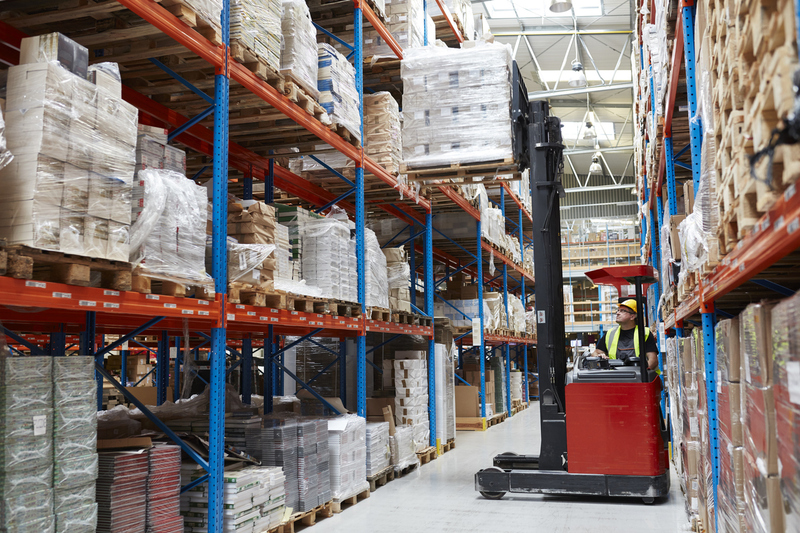 Seeing that video, and reading the story from England, made us realize it’s a good time to review some best practices when it comes to pallet rack and forklift safety. Anyone using a forklift needs to wear safety gear: hard hats, proper footwear and high-visibility vests or jackets, along with well-fitted clothing, as loose garments can get caught on machinery. Do routine checks before driving a forklift, looking at the breaks, tires, steering, and warning devices. Report any problems to management right away. Adjust mirrors and make sure all controls are within easy reach before starting the forklift. Do not operate the lift until you are safely inside with your seatbelt fastened. Only drive the lift in areas designated for forklifts and pay attention to posted speed limits, floor loading limits and clearance heights. Remember that forklifts are for carrying loads, not people. Never let other people ride on the forklift unless the vehicle has a second seat. Allow your employees to report forklift accidents anonymously. If they’re afraid of coming forward out of fear for their jobs, they might let an unsafe situation go unnoticed. Load each rack properly, with forklift operators placing pallets squarely on the rack, resting across load beams for proper weight distribution. Adhere to posted pallet rack weight capacities. These should be affixed to all the beams and uprights. If you aren’t sure of the weight capacity, contact the manufacturer to find out. Invest in rack protection solutions, which include end-of-aisle guards, bollards and post protectors. These tools, coupled with forklift safety precautions, can help protect your racks, and your workers. Using heavy duty wire mesh or netting can keep products from slipping off the back of the racks and onto your floor. Conduct routine inspections of your racks, from occasional visual examinations by your team to yearly third-party evaluations by professionals. Is it time to upgrade the pallet racks in your facility? Greystone Equipment can help. Whether it’s pallet racks, stacking racks or cantilever racks, we have something that will provide safe, effective storage solutions for your facility.